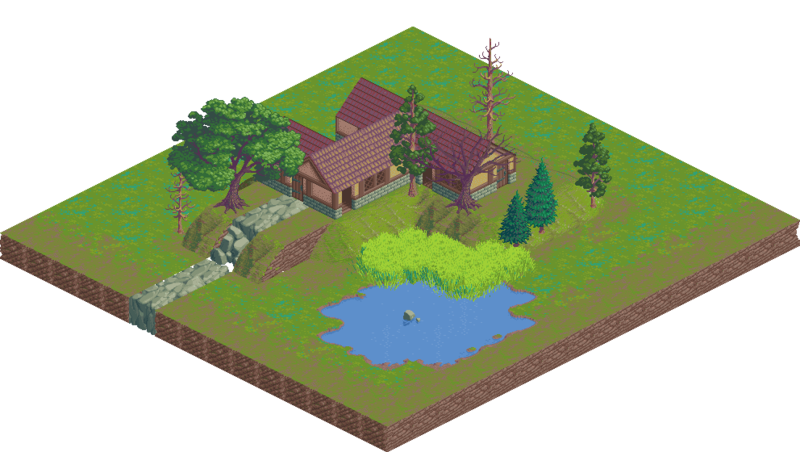 Designed for use with Yar's Isometric 64x64 Outside Tileset. The outdoor image was made with both tilesets. 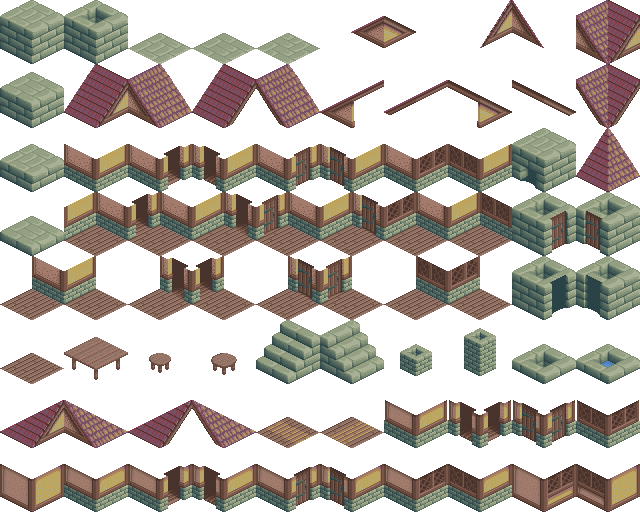 Houses inspired by Clint Bellanger's Medieval Building Tiles. Nice one, and great idea to expand an existing set! 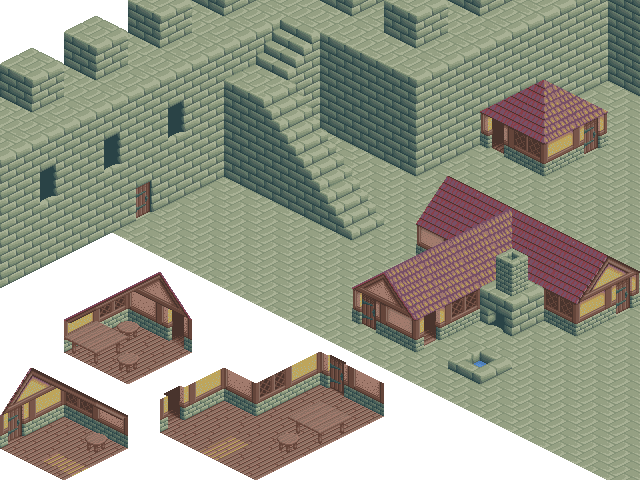 I started using Yar's tileset with the FLARE buildings to mock up a game idea. They fit well together, but I'm using smaller character graphics, so the FLARE buildings are too big and their high contrast makes the characters hard to see. Maybe it would have been a good idea to add some kind of padding (a wooden beam perhaps?) between the bottom floor tiles (e.g. door) and the next level (roof). You can see what I mean when you look at the square house at the top right, where the door and windows immediately go into the roof tiles. 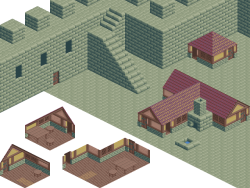 Also adding some little shrubs or bits of grass along the walls of the houses would probably help them blend in with the outside tileset. And finally, some shadows would work wonders. 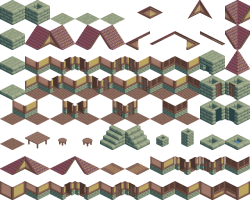 Nevertheless, the tiles look great already. Good work. Well done, I'm liking these. I added some new outside hosue walls with a little shadow at the top, and some corner pieces where the upper wall is slightly inset. This helps separate the roof from the doors and windows a little bit. please please please, somebody just use this beautiful scenery in some game. I mean both the building tile and the nature around it. The background is also perfect. nice.. now you can make a medieval x-com clone. Ye Ole X-Comme: Terrore From ye Deepe. Really great work, both of you guys (Yar too). Medieval/fantasy X-Com is actually very original and underused combination. I can imagine a few cool settings for it already. I.e. replace X-Com organization with inquisition fighting against some invading heretics/demons/dragons/warlocks with funding from various principalities. Alternative possiblity would be a single city/stronghold setting, like X-COM: Apocalypse. Or you can go underworld, combining X-Com with dwarf fortress. The first to do it will earn a lot money. Awesome, I love it. This style is what I like. I use your arts in my game.